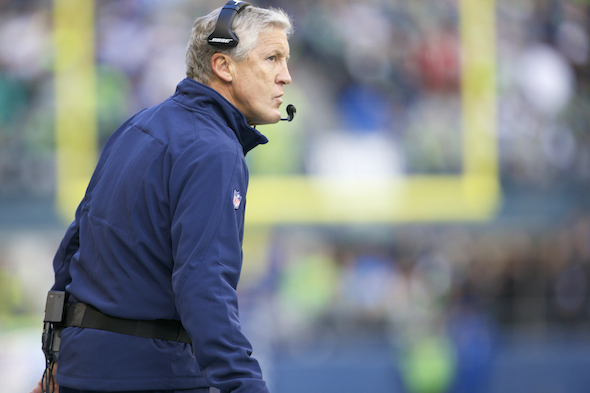 Back in the place where he was fired despite success, coach Pete Carroll and the Seahawks had a transcendent game against the NFL’s top team, the Patriots. “A nice little night,” he said. Heh-heh. Of course, he didn’t say that. And he’ll try to convince all of us he doesn’t even think in those coarse terms. Kraft was the owner who fired him after Carroll wasn’t like his predecessor, Bill Parcells, and gave the successor, Belichick, everything Carroll said a coach needed to succeed in the NFL. Belichick outmaneuvered him in the final minute of the greatest NFL game ever played to leave a mark on Carroll’s record that comes with its own siren and blinking red light. Brady was the quarterback who completed 13 of 15 passes in the final quarter of the most watched event in American TV history, against one of the greatest defenses the game has seen, by brilliantly ravaging the wounded FS Earl Thomas, CB Richard Sherman and SS Kam Chancellor — after CB Jeremy Lane went to the hospital with a arm broken and a knee torn up on the same play. And this was just another win? Like Mt. Rainier is a speed bump. The Seahawks Sunday beat the best at their best, in the best way possible for Carroll: In front of another national audience that has acutely debated the end of XLIX like no other game, he coaxed a goal-line stand from his defense to preserve the win as Belichick chose to throw from the one-yard line instead of giving the ball to one of the best short-yardage runners in the game. The irony here is capable of bending light waves. Nor is there anything in football like Seahawks-Patriots. Nor is there anything like the excruciating competitiveness of Belichick-Carroll. Nor is there anything like the marvelousness 0f old Tom Brady against young Russell Wilson. Never thought I’d write this, but the vibe is more intense than the one between Carroll and former 49ers coach and longtime contemptuous rival Jim Harbaugh. For one reason: Carroll respects the hell out of Belichick. “We played the best you can play out there,” Carroll said of the Pats, against whom he is 2-1 as the Seattle coach. “Great team. They have everything going for them — the best quarterback that’s ever played. Best coach that’s ever coached. You can’t get any better than that. Read that quote again and know that that is as close as Carroll will come verbally to a posterizing tomahawk dunk on an opponent. A nice little night. Hah. He also mentioned earlier the short practice week and the long trip, the Patriots’ bye and their general good health. He lined up all the advantages for the Pats, and his players knocked them all down. In his former home, no less, where he took the Pats to two playoff appearances in his three seasons and still was fired by Kraft, regarded as the NFL’s most successful and influential owner. Carroll never returned to the area until this weekend. Vindication? Validation? Closure? Redemption? Revenge? Carroll doesn’t deal in those words, even if each is partly true. He wasn’t even dealing in XLIX irony, despite the fact that every serious student of the NFL game was cramping up in amazement over the double helix developed by the two narratives. So then . . . how did it feel here tonight at Gillette Stadium, he was asked. Jeez, did he like it. Not only did he hang one on the NFL’s second-most insufferable franchise (Jerry Jones and the Cowboys have retired the trophy), he did it with Kam Chancellor and Earl Thomas blasting Pats players into trepidation and apprehension, then winning the goal-line battle in the final minute, five times denying New England inside the two-yard line. Carroll was thrilled that the game came down to the final play when Chancellor defended Gronk into nothing. Brady’s pass never came close. Carroll said the moment replicated the play that ended the Seahawks practice on Friday, with Chancellor defending one-on-one a scout-team tight end and coming away with the ball. The word “great” was tossed about a lot Sunday, rightfully so. Then Carroll offered this summary of his team. “I’m so fired up about these guys,” he said. “The resolve, the focus and the leadership we have allows us to be in moments like this and come through like this. It takes experience guts and grit. In November and December with Russell Wilson as the quarterback, the Seahawks are 30-6. After Sunday night, when Carroll and his Seahawks dunked on the Pats, a potential path begins to emerge toward something that may out-Cub the Cubs winning the World Series. A Seahawks-Patriots rematch in Houston. Dear NFL, The Seahawks beat the Patriots, in Foxboro, after a short week and a cross-country trip, with a rookie running back, and Michael Bennett at home watching the game on TV. You’ve been warned. I forgot to mention, great post, Art. Prosise and Chancellor. Huge difference makers. …and Bennett will be back. Does any other team have to fly cross-country after a Monday night game to play a team coming off a bye week this season? Just wondering how rare it is, as it seems patently unfair to the team that has to travel. Welcome to the new NFL. I remember the Ravens in 2013 played 3 games in 14 days. If you study schedules, you’ll see abuse is widespread. But Seattle gets hosed more frequently because of its distance from the regular world. That burden is why Carroll was so happy to win this game that he would have floated away if they hadn’t tethered him to the tarmac. It was sweet but hardly revenge. If the Seahawks beat the Patriots in the Super Bowl, then it is sweet, sweet, sweet revenge. I know, and that’s what I’m hoping for. Beating them in a SB rematch would be sweet revenge alright. If Seahawks can secure home field for the playoffs, just go ahead and write in the NE vs. SEA rematch. Would love to see Brady have to face a FULLY HEALTHY Seahawks defense in the SB….not an injured, Sherm, Kam, Thomas, And losing Lane in the 1st qtr….and missing Avril in the 4th qtr (the Pats finally stopped Bennett after a concussed Avril left the game). I still have nightmares of watching Tharold Simon getting burned all game that will never go away until Seattle takes down the Patriots to win it all. Statute of limitations on Steelers. Never. Can’t stand that organization or their fans. Thanks for the sliding scale. I didn’t know three sweets was the apex. “We played the best you can play out there”– you didn’t grasp the meaning. How about I insert the word that Pete deliberately left out? Thanks for being more aware than Mr. PM. You misunderstood the quote. His reference “played the best” was to New England, not Seattle. I probably should have clarified, but in context it seemed clear. And no one is saying it makes up for the SB, fergawdsakes. Seahawks didn’t play perfectly and still be Pat on the road. A good regular-season feat. That’s exactly what I thought you (and Carroll) meant. Got it Art, it makes sense now that I re-read it. Thanks for clarifying it. Great Column. Everyone can see something so apparent:Two great teams matching up against each other, A petulant overgrown child overwhelmed by getting what he has asked for. If it weren’t for their Superbowl match-up, this would easily rank as the the greatest football game I’ve ever seen. That said, the playoffs are still a long way off. Glad you appreciate this game’s rarity. Belichick and Carroll are so different, and so alike. It’s amazing how they get the same results from two opposite directions. While I can’t really see this as revenge or redemption – how does a regular season game at the halfway pole stack up with a Super Bowl? – I LOVED the cohesion, guts, character, impassioned energy, and resilience of this team and HAVE TO give it up for the dimension of leadership and grit that Kam Chancellor brought back with him. No rust on him, for sure, and an almost fanatical determination to win this game. It’s the first game this year in which contributions came from EVERYBODY, especially from two guys whose names we hardly heard at all, Jimmy Graham and Cliff Avril, who had Belechick so worried that he dragged resources away from every other Seahawk s try to stifle those two. It sorta worked…except that the real Seahawks finally showed up. It alkso didn’t hurt that Belechick is so uncertain of his coverage that he basically rushed three or eben TWO guys most of the game. And STILL, aside from ALL that, it was a hell of a game, right up to :00. I’m just dazzled this morning and just hope that this team, which seems at time to have a dearth of confidence, uses this as Proof that they can handle anybody on a night when everyone shows up. My point about payback goes to Carroll’s history with Kraft as much as the SB. Of course Sunday doesn’t equal the SB, but it is another remarkable chapter in a book I wish would never end. What was Pete thinking on the 2 point conversion? Why did he do that? Say what you will about the final outcome, but that was a TERRIBLE decision!! Here was the thinking: 9 points pretty much ends the game. My opinion: great strategy, bad tactic. Instead of a fade to Baldwin, how about a lob to Jimmy Graham? Graham was double-covered most of the game. He went for the jugular and a two-score advantage. Certainly highly debatable, but I understand wanting to put the game out of reach. But Seahawks had no running threat to help balance the defense. Pete’s teams are often behind early because he takes fewer risks while gaining information about what is working, and what is weakest in the opposing defense. He can get away with that because his defenses will keep it close. I can’t believe you’ve watched the Seahawks for a while under Carroll and don’t see how and why it works. You specifically used the term ‘early’ I can understand that part of it. I’m talking about the rest of the game as well. Can you explain to me what the hell happened to the Seahawks offense in SB49 after they went up by 10? Were they still gaining information then? As a lifelong Patriots fan, this matchup reminds me of the unforgettable Celtics-Lakers battles pitting Bird and Magic in the 80’s. They didn’t play each other very often. But when they did meet in the rare regular season game or the NBA Finals, they were always special and it was THE rivalry of the NBA. If you’re a real sports fanatic, you could only hope for another “nice little night” like this in February. That’s a great comparison, having said that, not sure how long Brady will be around for. Not likely to last until 2020 when the NFL schedule rotates back to AFC East. Pity. Good analogy, Roy. Celts-Lakes was always an event. Just like Pats-Seahawks. Hope you’re doing well. Great column, Art, I know you could have burned through another 2K words to get everything in. You got all the irony in. Against all odds, etc. I don’t know why some would pick at field goals and SB 49 when they just witnessed one of the most intense and satisfying games I’ve ever seen the Hawks play with great plays made by everyone, including the cheapest O-line in the NFL – Collingsworth was agape at that and so was I by how far they’ve come in a short week, and though the Pats front pulled back in the second half they came hard in the beginning. There were a couple O calls that some might question, but overall brilliant game planning. Somebody said with a play or two left that the Pats had NEVER been stopped inside the 2 during Belichick’s reign. Yeah, a good little night. So good I took 2 nighttime antihistamine and haven’t slept a wink since Sat. night . . . Thanks, John. It was an enjoyable write when you know you’ve witnessed a rare feat. I just wish these teams would play annually. “I’ll have what SHE’S having!! Are you sure you’re old enough for that kind of intensity? Art, this has to rank among your best columns ever. I thought when the Pats got a first down on 3rd and 25 late in the game that the Hawks were doomed. That they hung in there and came away with a W qualifies as miraculous. I am not a Belichick fan, but after the final whistle, when he gave Carroll what appeared to be a very warm hug, I couldn’t help but be moved. Brady makes so many third and longs, against everybody, that that capacity alone makes him the best all-time. What you saw between the coaches was sincere respect. Each knows how hard it is to stay good year after year.